You Are Here:Home / Latest posts / Bleach: Friend or Foe? There’s a right way and a wrong way to use bleach. Here’s some information to help you keep your kids and staff safe. Keeping the child care environment clean is one of the best ways to help ensure that children stay healthy. Dirty toys, bedding, linens, eating utensils, and surfaces can carry and spread germs. Regular disinfecting should be a part of the routine in a Child Care setting. Preventing the spread of germs is a challenge in child care programs. 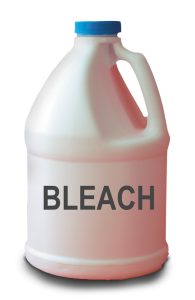 A solution of household bleach and water is an inexpensive and easy way to disinfect surfaces and sanitize objects in child care programs. But child care providers need to be careful to use bleach correctly to ensure that children are safe and surfaces are properly disinfected or sanitized. discussing green cleaning, sanitizing and disinfecting.